Amsterdam, Netherlands – Philips Respironics, a business of Royal Philips (NYSE: PHG, AEX:PHIA), today introduced the Dream Family solution to help improve the sleep therapy experience for people with obstructive sleep apnea (OSA). The solution is comprised of an innovative mask that comes closest to making users feel like they don’t have anything on their face1, a positive airway pressure (PAP) therapy device that was designed based on patient feedback, and engagement tools to keep patients motivated to use therapy as prescribed. The Philips Dream Family is the latest suite of Philips sleep and respiratory solutions that connect and support the patient, clinician and homecare provider to enhance patient care and quality of life. More than 8 million patients with sleep apnea today report that they struggle with therapy2. 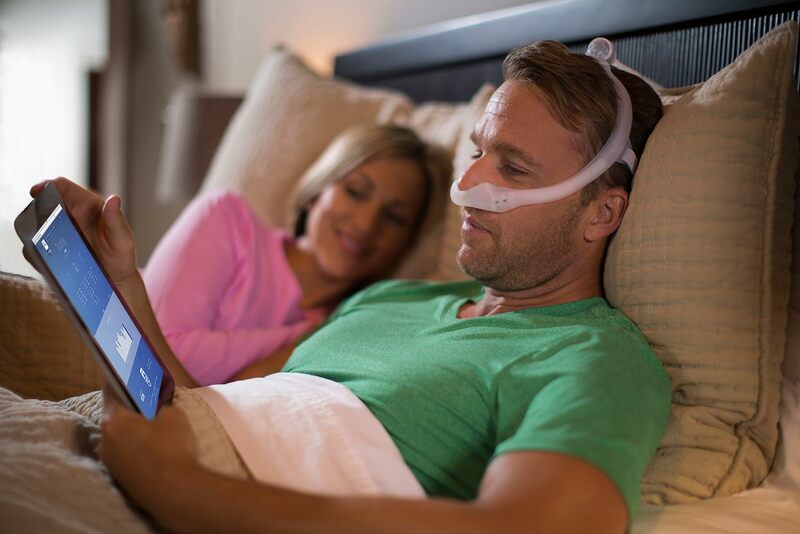 Designed to help patients feel like they are not wearing a mask, DreamWear directs airflow through the sides of the mask frame so patients can sleep comfortably in any position with more freedom to move in bed. With DreamWear, patients have a clear and natural line of sight, while the minimal contact, under-the-nose cushion prevents red marks, discomfort or irritation in the nostrils and on the bridge of the nose3. Users rate DreamWear more comfortable, more stable, easier to use and more appealing than their prescribed mask4. DreamWear adds to Philips comprehensive line of patient-centric therapy masks, including Amara View, Wisp and Nuance. Developed with a patient-driven design to help new and experienced patients use therapy long term, the quiet, small and light DreamStation provides daily user feedback via an intuitive color screen. DreamStation includes the most comprehensive suite of connectivity options (Wi-Fi, Cellular, Bluetooth) available among the leading continuous positive airway pressure (CPAP) brands5, making it easier to access patients’ clinical and use information and creating strong lines of communication between clinicians and patients. Aiming to help patients adapt to therapy, DreamStation not only makes device trouble shooting easier to provide patients with peace of mind, but also offers a range of software features to help patients adjust to and continue to use therapy. DreamMapper, the new generation of Philips’ SleepMapper, is designed to help new patients adjust to sleep therapy by actively engaging them through daily reminders and encouragement messages. The mobile and web-based patient support application, accessible via phone, tablet, or PC, offers motivational alerts, troubleshooting advice and educational content to engage patients in their sleep therapy. DreamMapper enables patients to make adjustments to improve fit and comfort on their own, reducing instruction time needed from a clinician or homecare provider. The engagement features of DreamMapper encourage successful therapy use. DreamMapper has been shown to result in 22 percent greater adherence to therapy than patients who did not use DreamMapper6. Dream Family is the latest addition to Philips’ patient-driven, easy to use and connected solutions. Philips provides solutions to help patients who are diagnosed with sleep apnea. For more information on Philips’ advanced solutions for sleep and respiratory care, follow @PhilipsResp and the Philips Respironics Facebook. 6 In a retrospective review conducted by Philips Respironics of approximately 15,000 SystemOne patients, patients who used SleepMapper, which has been rebranded to DreamMapper, demonstrated 22% greater adherence to the therapy than patients who did not use SleepMapper. Visit www.dreammapper.com/compatible to see a list of compatible DreamMapper devices. Dream Family is the latest addition to Philips’ patient-driven and connected solutions.